Although his legacy frequently threatens to be buried under 30 years of muscles, explosions, and relentless, unstoppable underdogs, it’s important to remember from time to time that Sylvester Stallone originally made a name for himself, at least in part, as a screenwriter. Between Rocky, First Blood, and more than two dozen other movies, no blockbuster action star has ever had as many “screenplay by” credits to his name. And while many of those movies were admittedly largely concerned with men’s faces and the various ways to violently juxtapose them with fists, guns, and grenades, it’s also clear that Stallone’s identity as a writer is still extremely important to him. 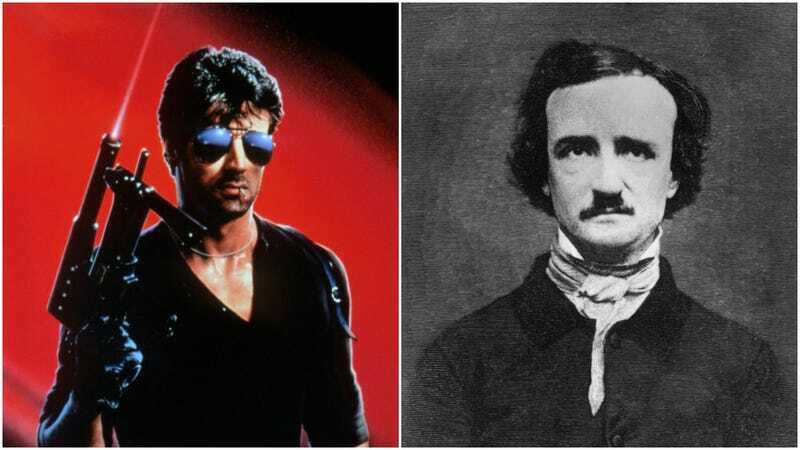 Hence, presumably, the Edgar Allen Poe thing: Stallone has reportedly been working on a script for a biopic about his fellow esteemed writer for going on multiple decades now, with occasional forward movement happening every generation or so. (At one point, Stallone himself was hoping to play the slight, neurotic New Englander; later, he somewhat more reasonably pushed for Robert Downey Jr. to play the role.) Although the project has never gotten much traction—outside a brief period in the mid-2000s, where Stallone seemed a little more confident about getting it off the ground—it’s back in the public’s bemused attention right now because of the star’s social media, where he’s been talking up his efforts to finish it at long last. Looking over a desk that appears to be absolutely covered in earlier drafts and research materials, Stallone reflects on the Poe script being “one of the great challenges of [his] life,” while also noting, in a surprisingly touching sentiment for an Instagram video about Sylvester Stallone obsessing over Edgar Allen Poe, that he’s determined to see the project through to the end, no matter what. Also, he makes his own “Yo, Poe” joke, forcing us to go with the far-less instantly relatable “Poe-bra” instead, so, hey: Point to you, Sly. We also would have accepted "Rocky Bal-Poe-a"